Long Valley is a triangular area of streams, wet and dry vegetable fields, ponds, grass, scrub and small areas of fung shui woodland situated just west of Sheung Shui between the Sheung Yue River and Shek Sheung River. It is the most important area of agricultural wetland remaining in Hong Kong and attracts a wide variety of marshland and open-country birds, including breeding Greater Painted-snipe. Common resident open-country species include Crested Myna (sometimes joined by Common Myna), Eurasian Magpie, Large-billed and Collared Crows, Domestic Pigeon, Spotted Dove, Oriental Magpie Robin, Red-whiskered, Chinese and (the more local) Sooty-headed Bulbuls, Masked Laughingthrush, Greater Coucal, Common Tailorbird, Long-tailed Shrike, Eurasian Tree Sparrow, Scaly-breasted Munia and Black-collared Starling. The latter species builds conspicuous untidy nests at the top of the poles carrying cables across the valley. Marshland birds you might expect to see in winter include various egrets and herons, Greater Painted-snipe, Black-winged Stilt, Pied Avocet, Wood, Common and Green Sandpipers, Common Snipe, Little Ringed Plover, Eastern Water Rail and Ruddy-breasted Crake. 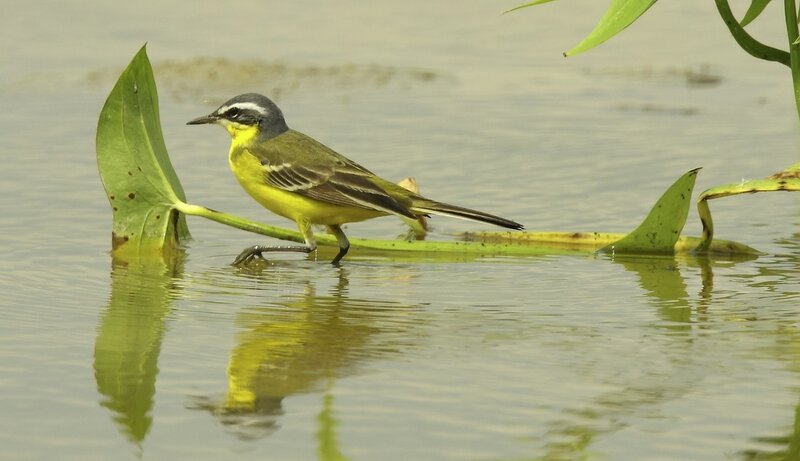 Passerines at this time of the year include Eastern Yellow and Citrine Wagtails, Red-throated, Olive-backed, Richard’s and Buff-bellied Pipits, Dusky Warbler, Stejneger’s Stonechat, Siberian Rubythroat, Bluethroat, Chinese Blackbird and Red-billed Starlings. Long Valley is, however, most productive during migration periods with spring being best for waders and autumn for passerines. Additional waders that turn up in spring include Oriental Pratincole, Pacific Golden Plover, Long-toed and Red-necked Stints, Sharp-tailed Sandpiper and Red-necked Phalarope. October and November are the best months of the year, especially with the green rice-growing programme that has been implemented in recent years. Of particular note are buntings – 12 different species were seen in the fields in November 2014, although this was, for some reason, a particularly good year! Long Valley is also a good site in autumn to see Amur Falcons on migration, and possibly Oriental Honey Buzzard. Summer tends to be quiet, but a few cuckoos might be seen. A sketch map roughly modified from the map in my book “Hong Kong Nature Walks: the New Territories” can be found here. You should bear in mind that, as this is an active agricultural area, the fields are constantly being modified. 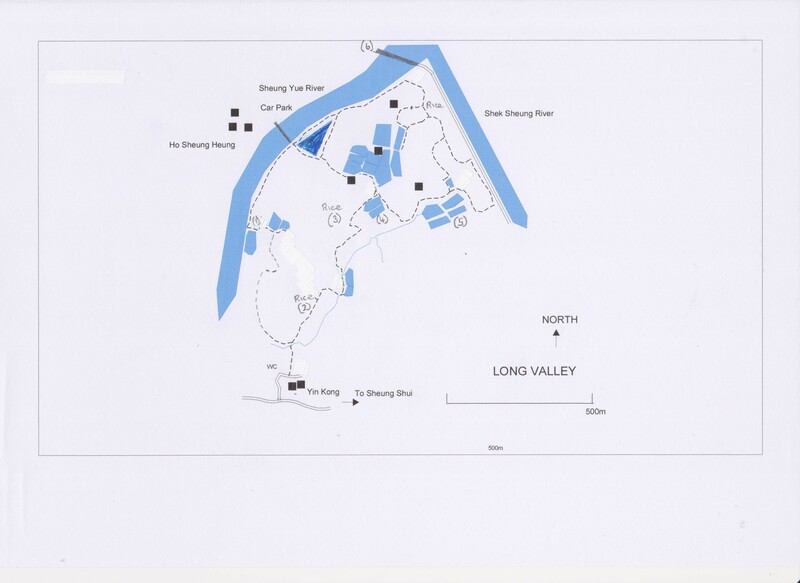 I usually park at Ho Sheung Heung and walk a circular route through the fields as detailed below. Others approach the area from Yin Kong in the south. The brief description that follows is a suggestion only, but it does take in the key areas, especially the rice fields in autumn. From Ho Sheung Heung cross the bridge over the embanked Sheung Yue River and turn right. The river is tidal and at low tide there are usually Great and Little Egrets, Grey Herons, Green and Common Sandpipers, White Wagtails and Collared Crows to be seen. Enter the fields just before a deep pond (1) and inspect the two small ponds on the left for snipe, Wood Sandpipers, Black-winged Stilts and other water birds. These birds are likely to be seen elsewhere in the area during the winter months if they are not present here. Tracks lead directly across the fields (sometimes planted with vegetables, so then impassable) or in a loop to the southern rice fields (2) and central rice fields (3). 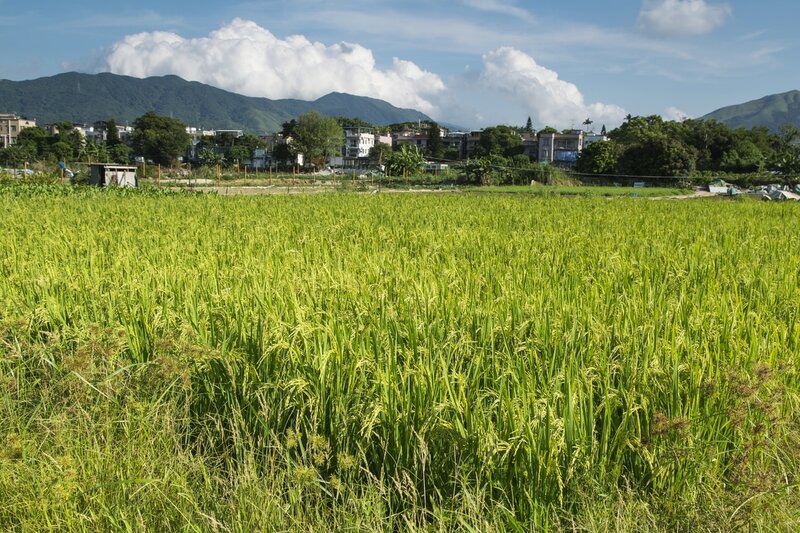 There are two rice crops during the year – one in summer, one in autumn. The summer crop attracts large numbers of tree sparrows and munias, but it is the autumn crop that is of most importance to bird watchers as in November/early December the rice attracts a variety of migrant buntings as well as other species. One of the two ponds (4) a little further on is also usually planted with rice and attracts similar birds to the other fields. The ponds a little to the north of here, viewed from an embankment to the left usually hold a few wintering Eurasian Teal and Northern Shoveler as well as a variety of waders. Little Grebe and Common Moorhen sometimes breed here. The trail leads west to a collection of conservation ponds which again should be inspected for water birds. From here, trails along the bunds head to the north, where there is another small area of rice. A bridge crosses the Sheung Yue River where it meets the Shek Sheung River. Just the other side of the bridge (6) to the right, there is a small wood beside a stream. This wood can be good in winter – especially during cold weather – for thrushes, Daurian Redstart, Red-flanked Bluetail and Red-throated Flycatcher. Long Valley is situated close to the Chinese border near Sheung Shui in the northern New Territories, Take the MTR to Sheung Shui on the East Rail line. It is a short green taxi ride from the station to Ho Sheung Heung or Yin Kong. Minibus 51K goes from near the station to Ho Sheung Heung. It is also possible to walk to Long Valley from Sheung Shui station past the village of Tsung Pak Long and along the Shek Sheung River. The above account is adapted from my book “Hong Kong Nature Walks: the New Territories”.